When I arrived at the course today, I made a point to make the 14th hole on the South Course my first stop. I’d heard about the tournament’s annual tribute to the military and wanted to see it for myself. What I witnessed is an incredibly classy use of a golf hole. For those unfamiliar with a tradition that is now in its fifth year, the flag on 14 is an American flag. When the golfers reach the green, one of the caddies removes the flag and hands it to one of two waiting servicemen, who are in full dress. 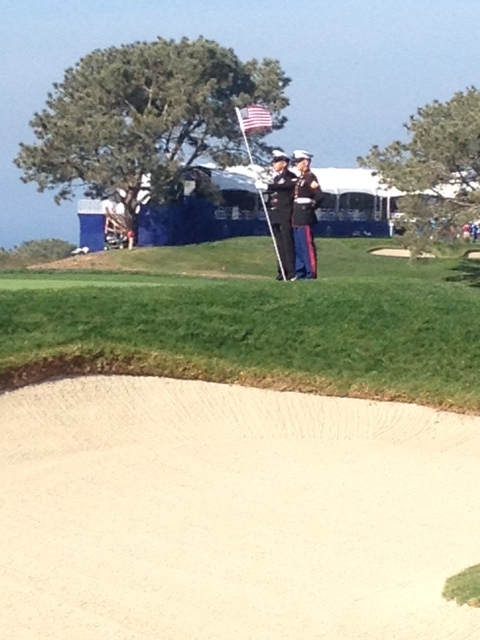 The servicemen hold the flagstick to prevent the flag from touching the ground in a breach of flag etiquette. When play of the hole is finished, the caddie retrieves and replaces the flagstick and then two more servicemen rotate in for the next group. This is all staged at a hole were the grandstand, called the Patriots’ Outpost, is filled with active-duty soldiers, sailors, Marines, airmen and Coast Guard, all of whom receive free admission to the tournament. What a great way to give back to the veterans and honor their service. The hole is sponsored this year by a company called ViaSat, which is a provider of network services. ViaSat President Rick Baldridge says half his company’s business involves the military so sponsoring the hole was a natural. The sponsorship included providing the attending servicemen with free Wi-Fi at the event. “San Diego is a great military town, and giving these guys a venue to come out and bring their families, it’s exciting to them. The military guys love golf. That’s why all the bases have golf courses. I can’t improve on that, but I’ll just say I wish all, instead of some, golfers acknowledged the servicemen before moving on to the 15th tee. Doesn’t seem much to ask. This mini-feature is an attempt to look at a pivotal hole each day through the eyes of a former pro who has played the tournament. Our pro is Scott Bentley, who played the tournament three times in the 80s-90s, which, of course, is before the redesign of the South. Still, 11, 12, 13 was a pivotal stretch then and certainly is now. Bentley says it’s hard to talk about 13 without mentioning the holes that precede it, 11 being a long par-3 and 12 being a notoriously tough par-4 back toward the ocean. Then 13 is a par-5 that played over 600 yards on Thursday. There are two tee boxes for No. 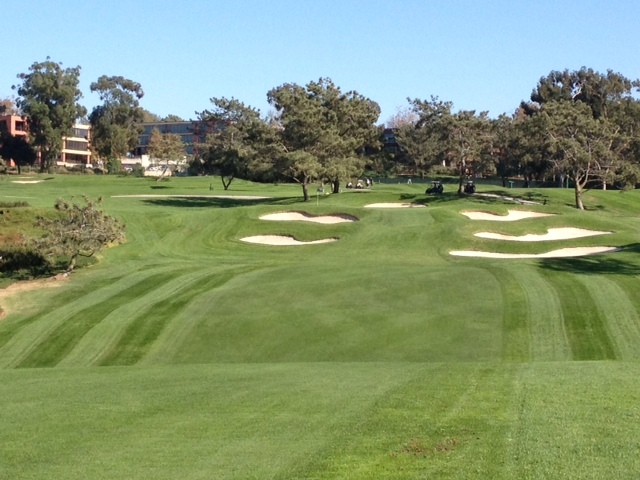 13, one being far right that makes the hole more of a dogleg left. That’s how it was played Thursday. And it was a three-shotter for each of the groups I saw come through. The ones who struggled the most were those playing their second shots from the thick left rough. 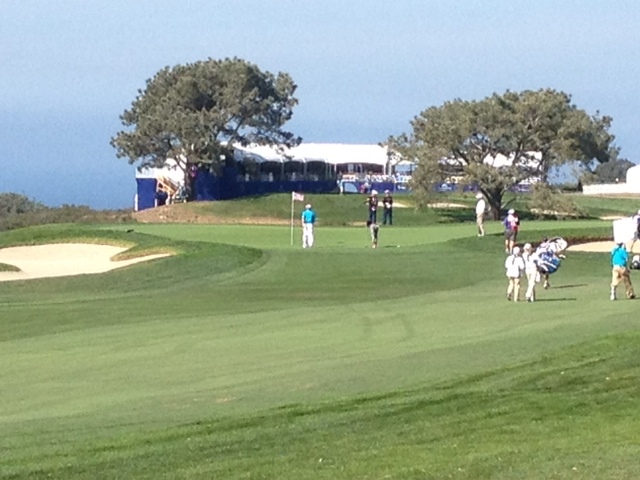 That included Tiger, but unlike the others, who bogeyed, he managed to save par. The 13th green is front by tiered bunkers, making coming up short quite undesirable. “You’ve really got to think about your second shot there if you don’t get home in two, because you want to leave it on an upslope. The greens are firm and won’t hold shorter shots. Bentley is now the Golf Course Manager at Torrey Pines and Mission Bay. He’ll give his hole insights daily here, and we thank for him volunteering. If you haven’t yet seen it on TV, you won’t be able to miss it at the course. Adidas is debuting it’s new adizero blue shoe at the tournament. It’s being sported by all the TaylorMade players and is prominently displayed around the course, including the patio of the clubhouse. The shoe, in its many styles of blue, is a pleasing color contrast to the launch of the initial line and is certainly less loud that the Big Bird-yellow shoes many players wore a year ago. It’s also worth a mention is Phil Mickelson’s blue KPMG hat is on sale at the merchandise tent on the South Course. The proceeds of sales of the hat go to fight illiteracy. You can learn more at philsbluehat.com. Tiger Woods’ 2014 tournament debut prompted another round of will-he-or-won’t-he regarding breaking Jack Nicklaus’ record for victories in major championships. As most golfers on the planet should know, Jack’s record is 18 and Tiger has been holding at 14 for five years now. I didn’t discover this until I got home and watched the tape of the broadcast, but The Golf Channel’s Gary McCord added a new two-cents of perspective on the chase. McCord talked about Tiger now being age 38 and what it would take to break Jack’s record with 19 majors. He used Phil Mickelson’s five majors as a gauge. “So to get to 19, he’s got to have Phil’s career starting at age 38,” McCord said. This entry was tagged Adidas, adizero, Farmers Insurance Open, Gary McCord, Golf Channel, military appreciation, Phil Mickelson, Tiger Woods, Torrey Pines, ViaSat. Bookmark the permalink.